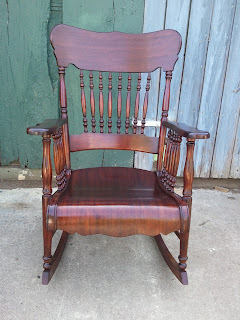 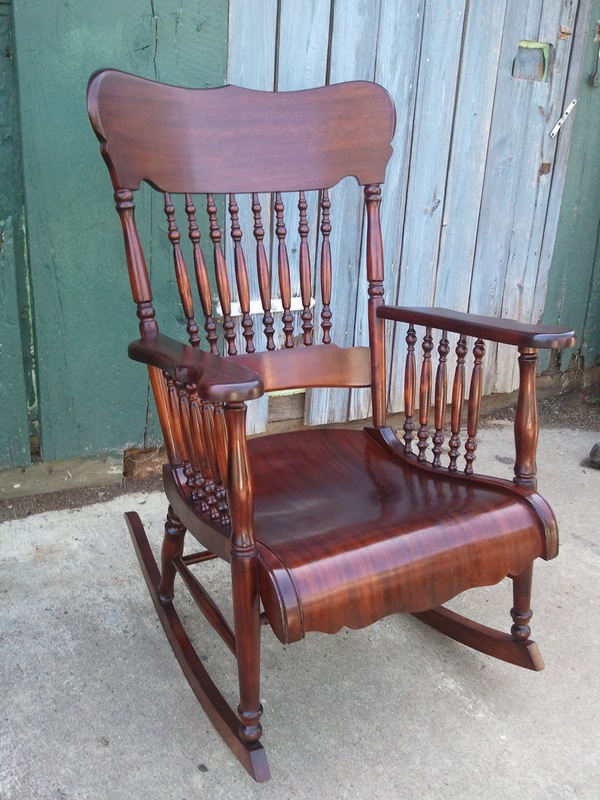 Recently I completed the restoration of a rocking chair made some where close to the turn of the century. Typical of much of the furniture if the time period, The chair was made from a strong and durable wood,in this case Maple. 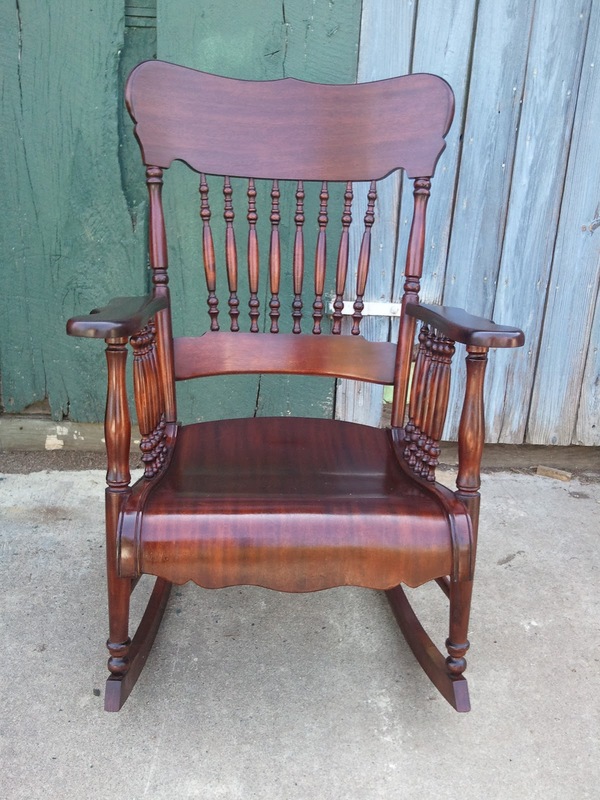 For a bit of flare and to resemble a finer chair, veneers of quality hardwoods, in this Mahogany, were used in key areas to accent the chair. 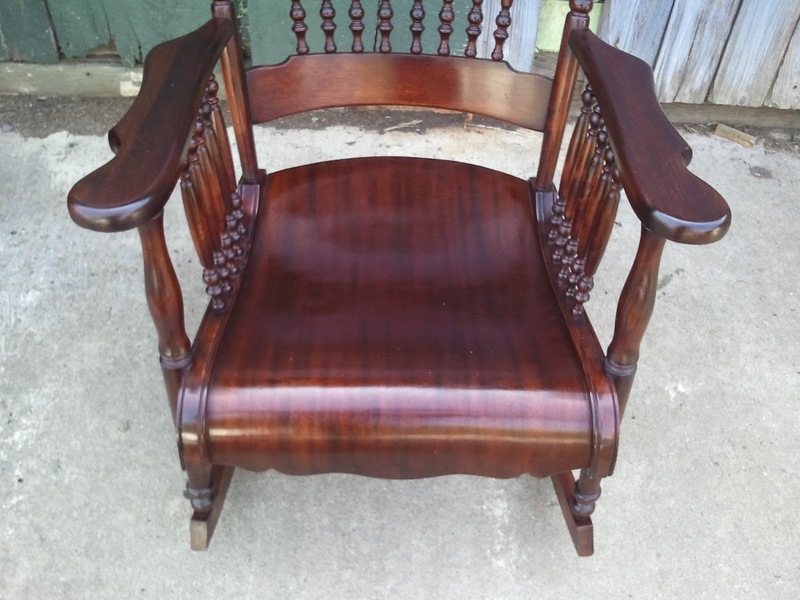 In this rocker, Mahogany veneer was used on the front face of the crest rail and also the seat. 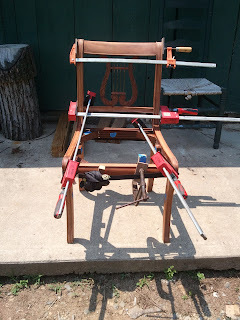 The rest of the seat is made of thin layers of wood molded to the shape and glued together, essentially a piece of molded plywood with a Mahogany veneer. 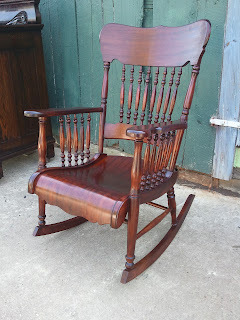 One exception to this list of woods was the use of Chestnut in the front right post (as seen facing the chair). 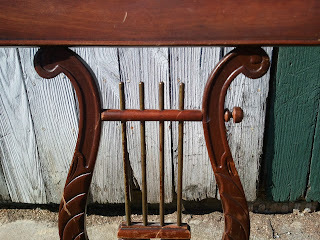 There is no reason why one post would be maple and another of chestnut, except that that is what was available at the time or that it was an extra piece lying around they decided to use. 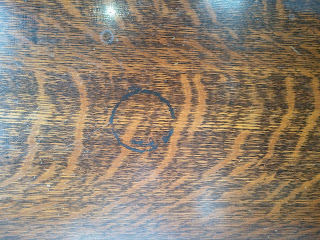 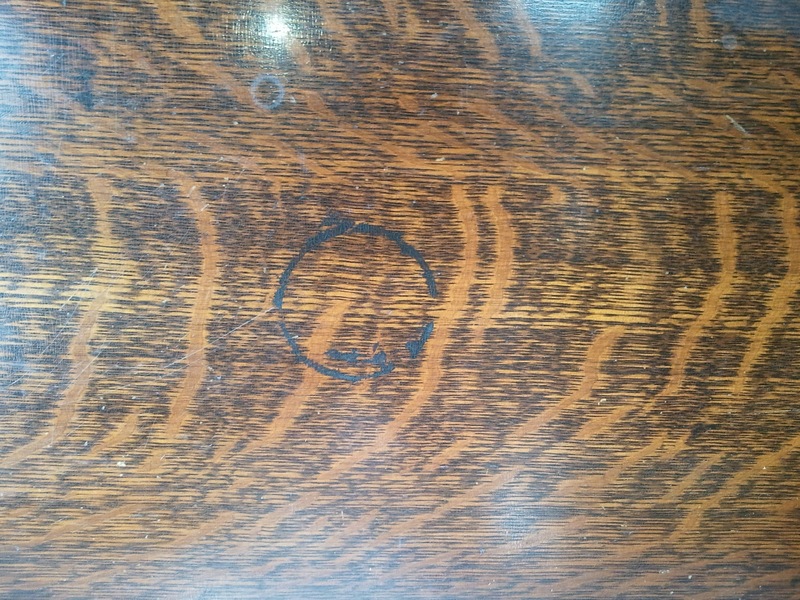 Either way, the difference in woods was and is largely covered by the stain on the chair. 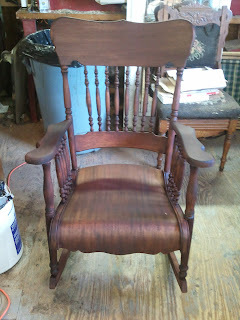 The chair was in good shape structurally, but it needed a new finish badly. 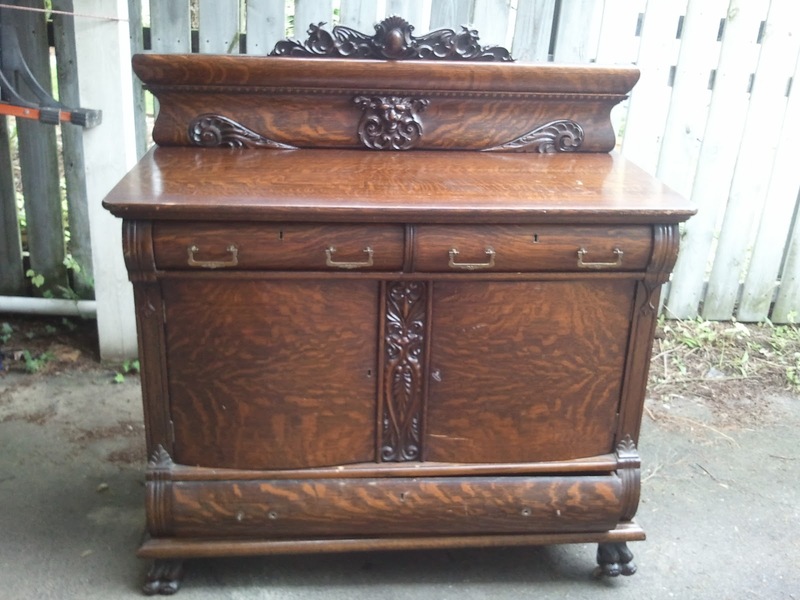 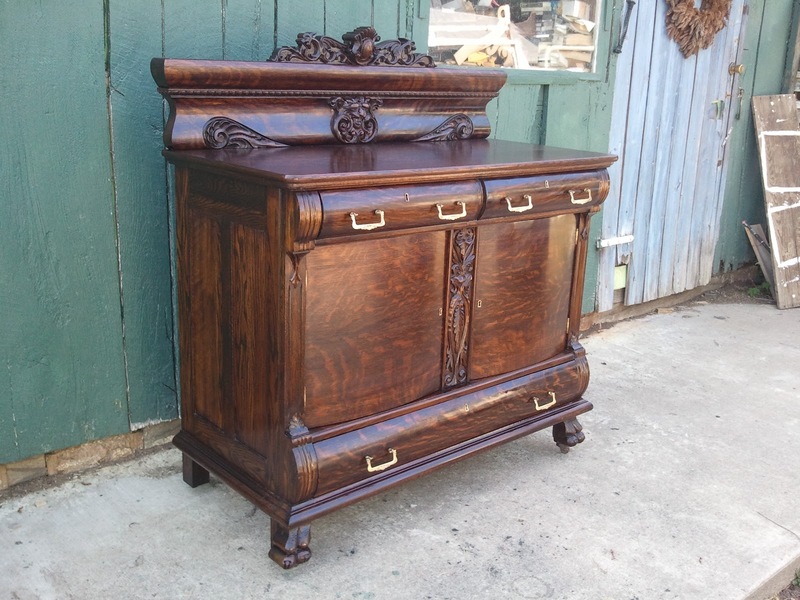 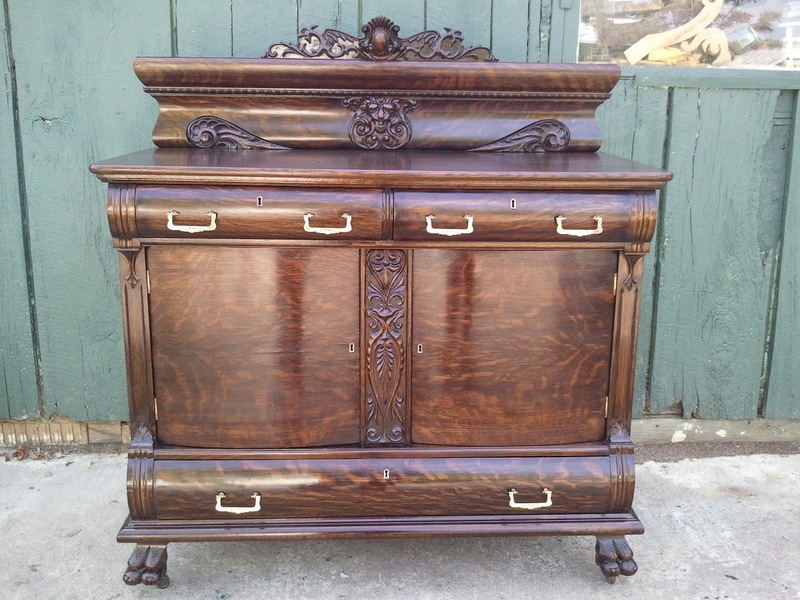 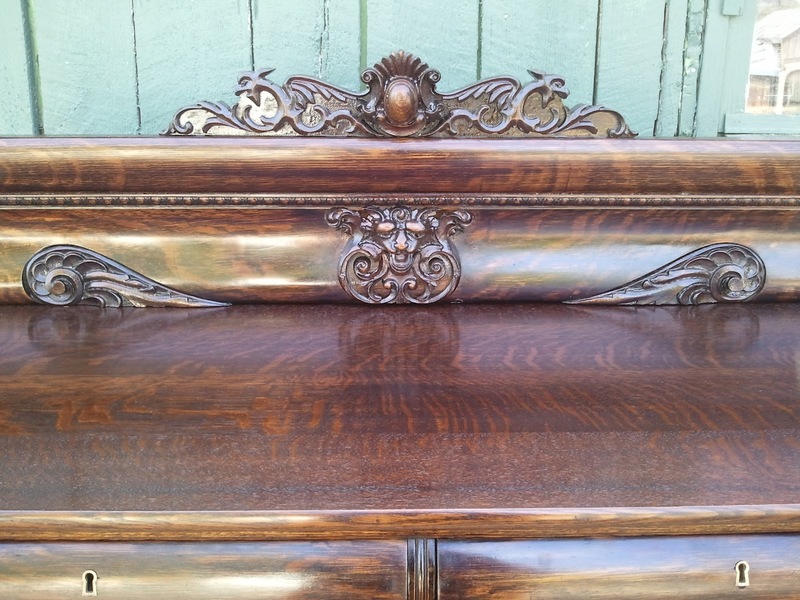 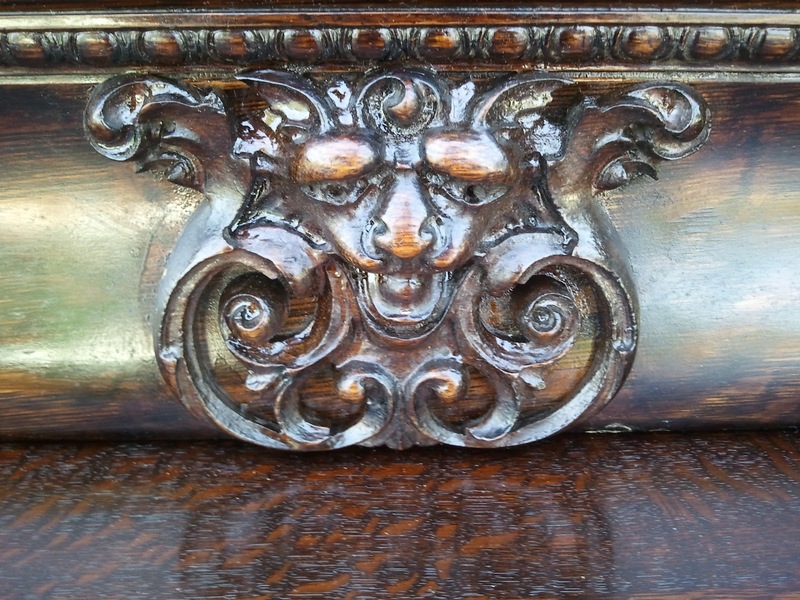 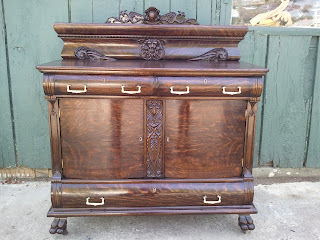 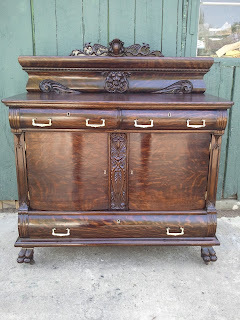 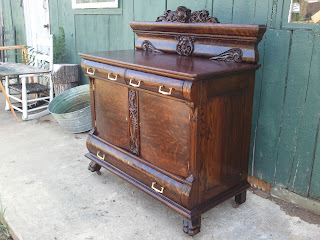 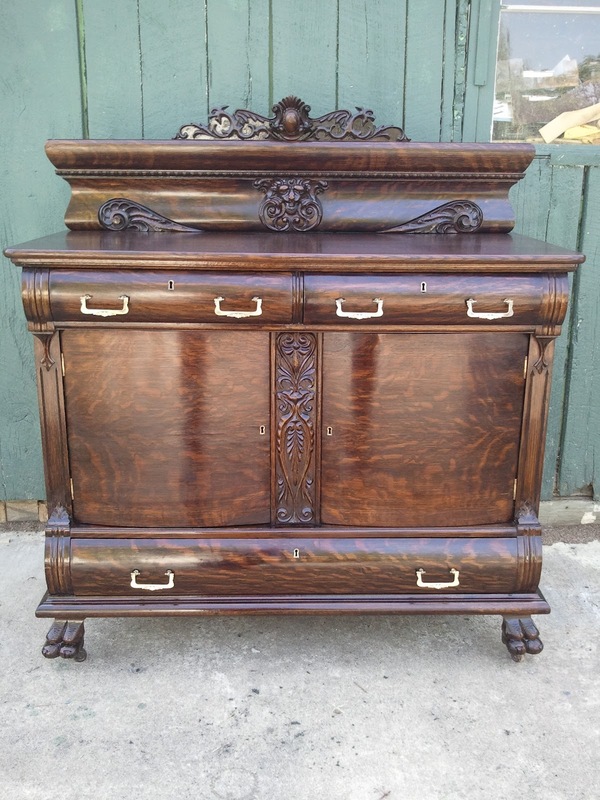 the old finish had become thick and dark and the beauty of the Mahogany veneers was hardly visible. 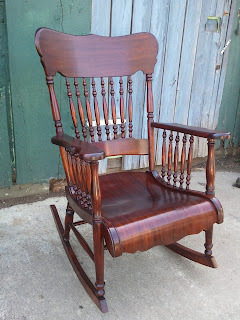 Basically, we removed the finish from the chair, re-stained it, and put on the new shellac finish using French Polishing techniques. 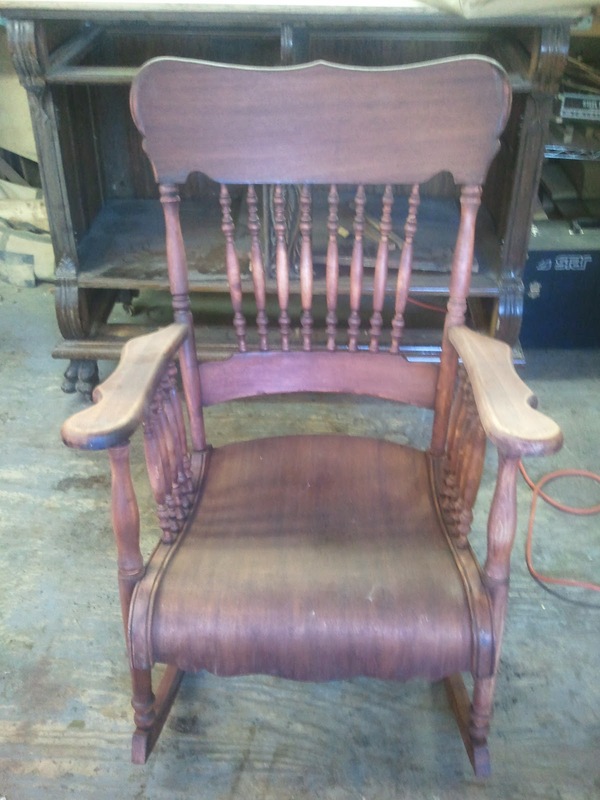 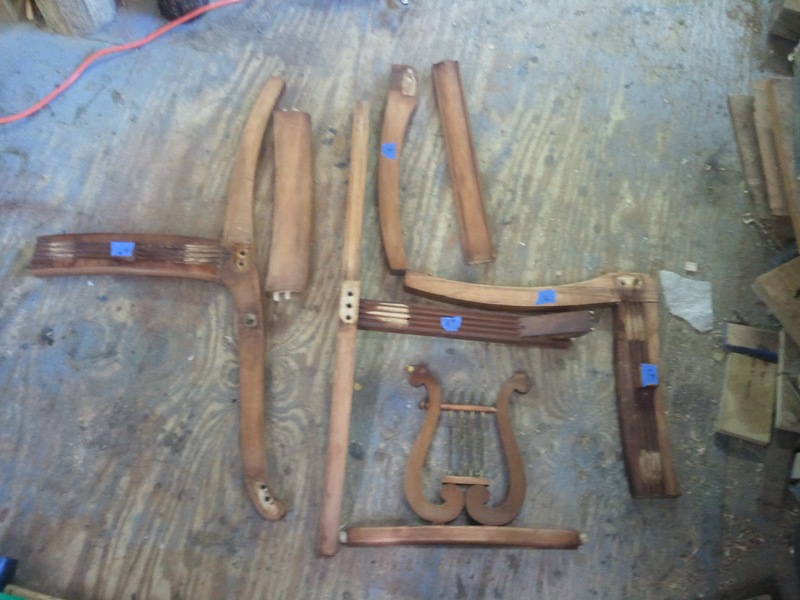 Below are a few photos of the rocking chair going through the process. This first photo shows the chair just after the finish was removed. 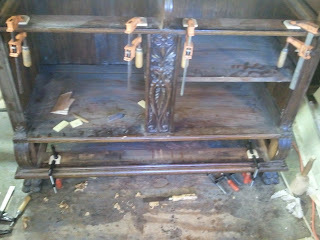 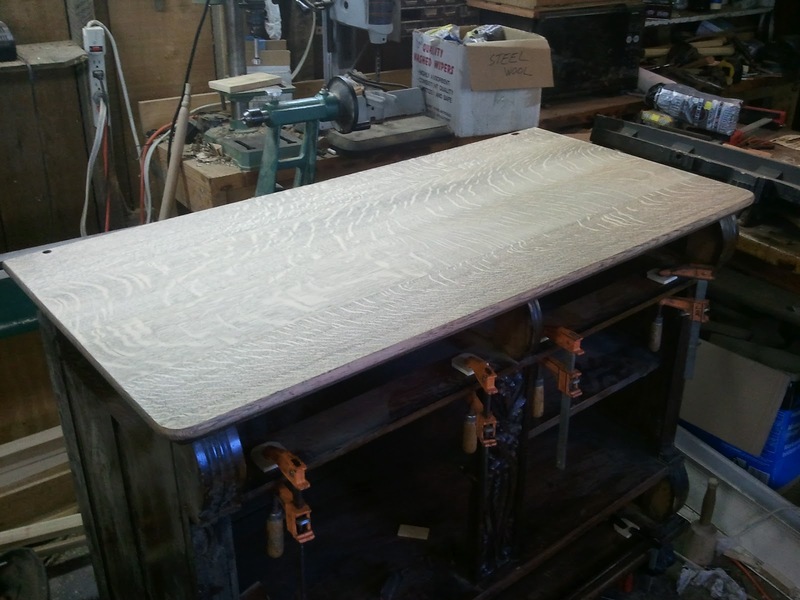 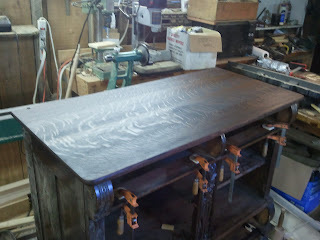 The next step in the process was to sand the entire chair to remove any residue from the old finish. 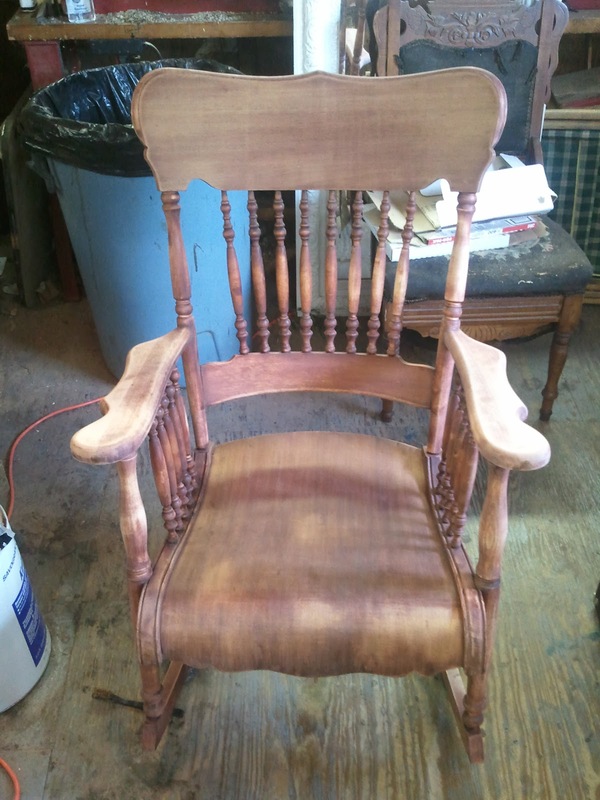 Here the chair appears after it has been sanded. 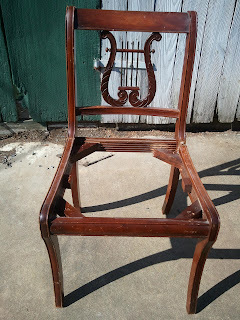 The old red stains they used are hard to completely eliminate, but there is really no reason to do this because the chair was stained again to match the original color. 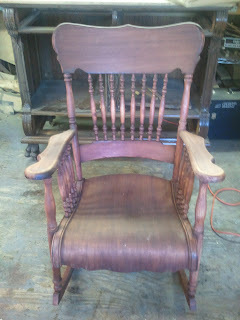 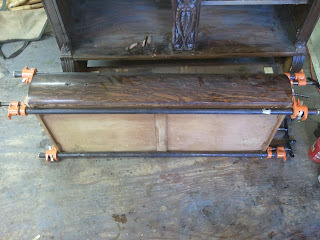 This next photo shows the rocker after it was stained. 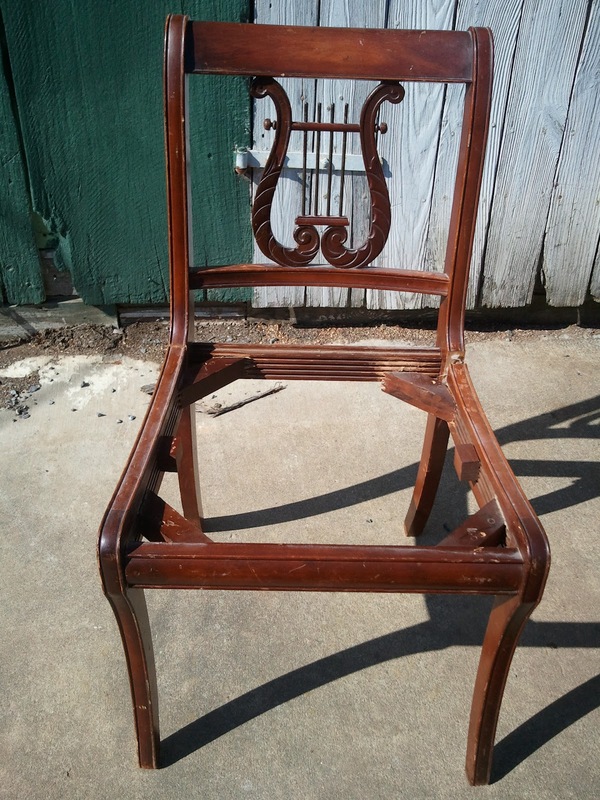 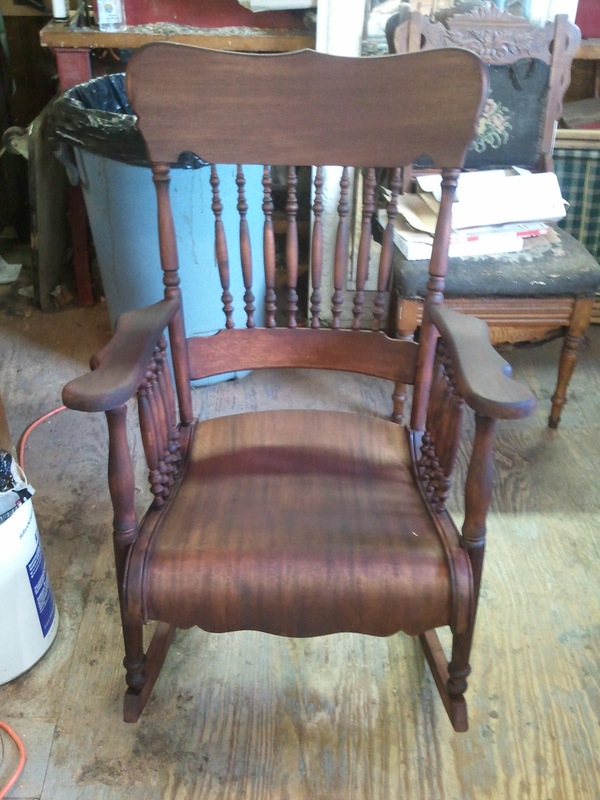 These last four photos show the chair completely restored. 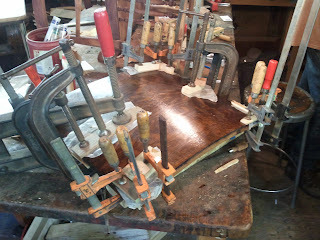 The very last photo is a close up of the seat, which shows the beautiful Mahogany veneer that was used. 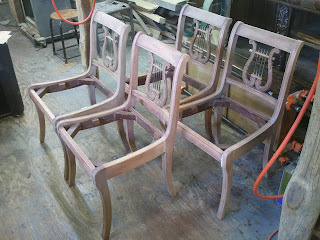 The chairs I worked on were reproductions, and lacked some of the refinement seen in originals or high end reproductions. 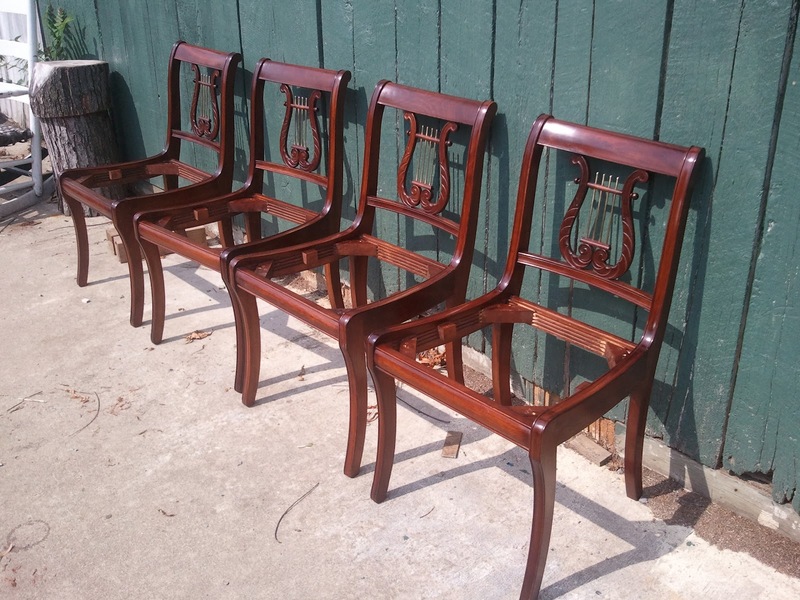 These chairs were made in a factory and, as is often the case in factory furniture, ease of repeated manufacture dictates design choices. All of that being said these chairs have nice lines and look great restored. 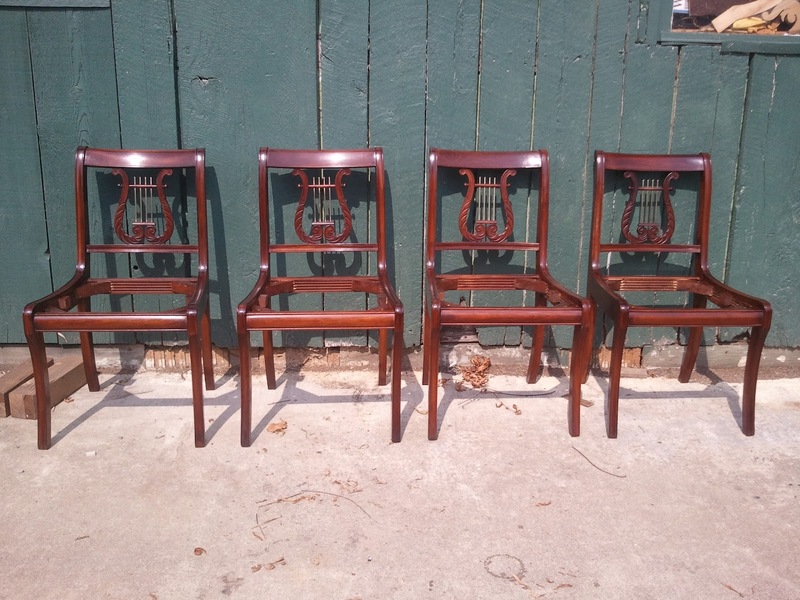 The chairs are made primarily from Birch with the exception of Mahogany used on the lyres. 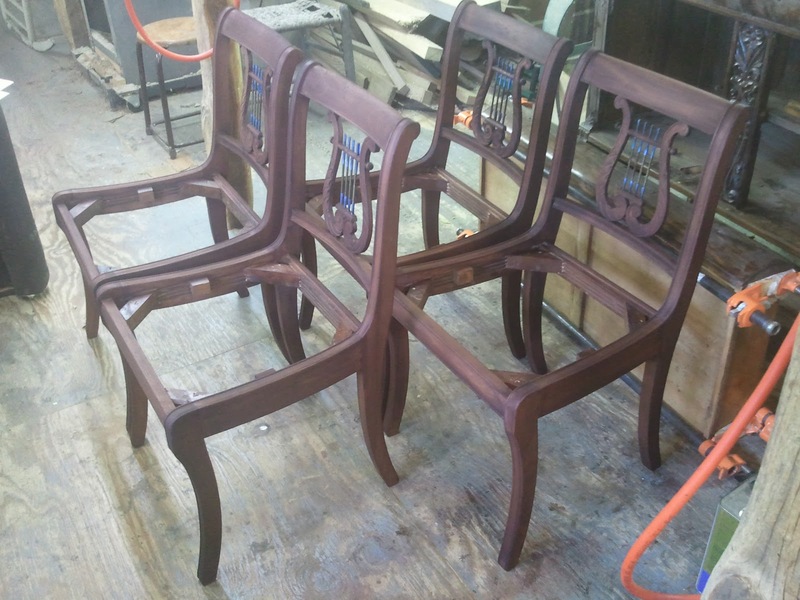 The chairs originally were stained during the finishing process, with the result of making them uniform in color and hiding any defects or color variety in the wood. Likewise, the grain of the wood is also obscured when this process is used. 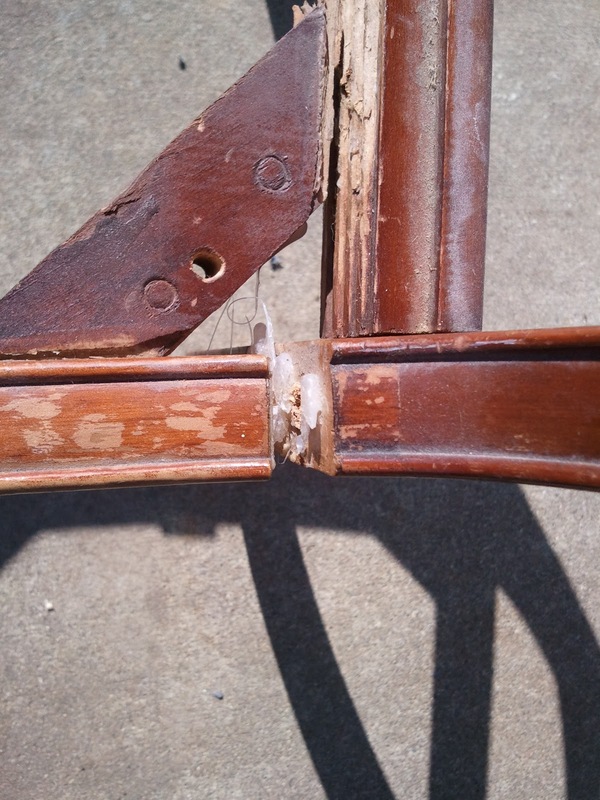 Because of this and the fact that there was some significant dings and scratches overall, the customer decided to have the chairs refinished. 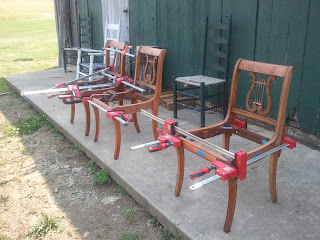 besides the finish work, the chairs were loose and needed to be glued. 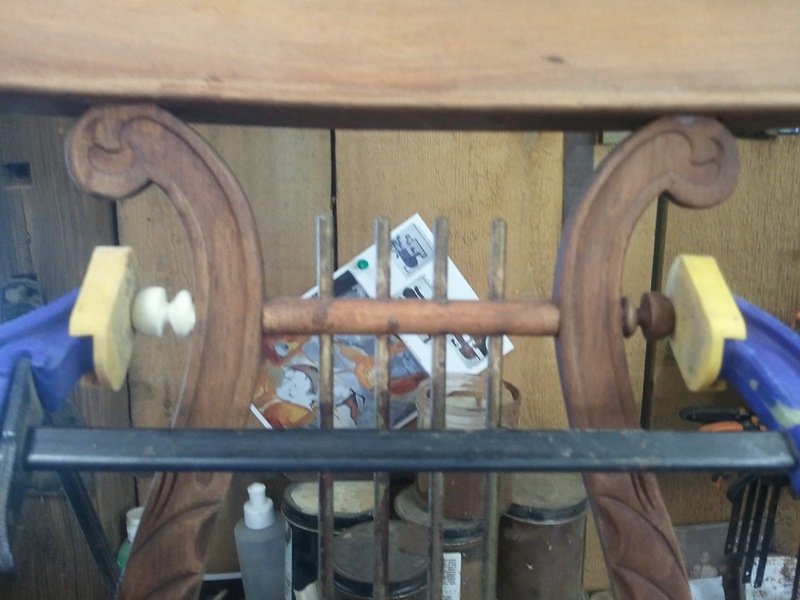 There was also one glue block missing and one turned finial on one of the lyres that needed to be replaced. 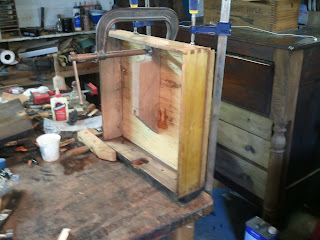 Below you can see some photos of the entire process. 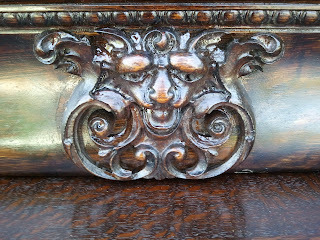 Here is a photo of one of the chairs as it came to me. This photo shows some broken dowels and separated joinery. 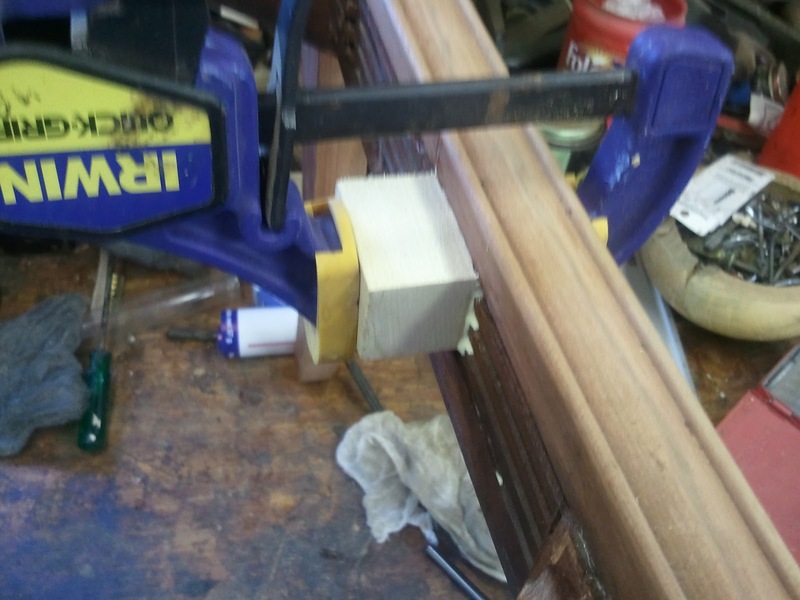 Originals would have mortise and tenon joinery as well as different glue blocks. 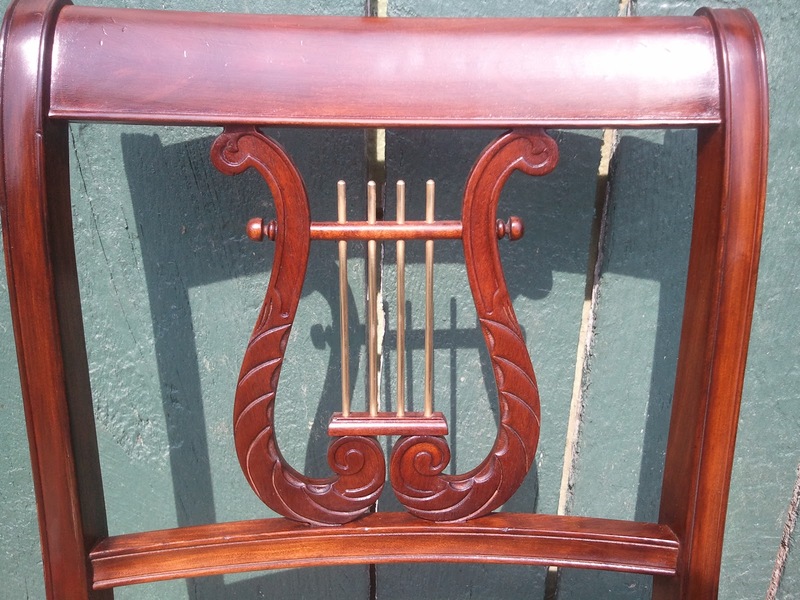 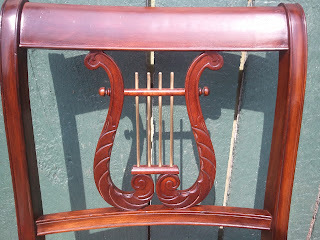 This is a close up of the lyre with the missing finial. After the finish was removed, the chairs were disassembled and the joints were cleaned. 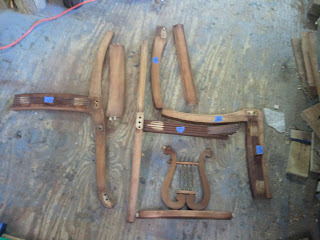 The chair below was completely disassembled. 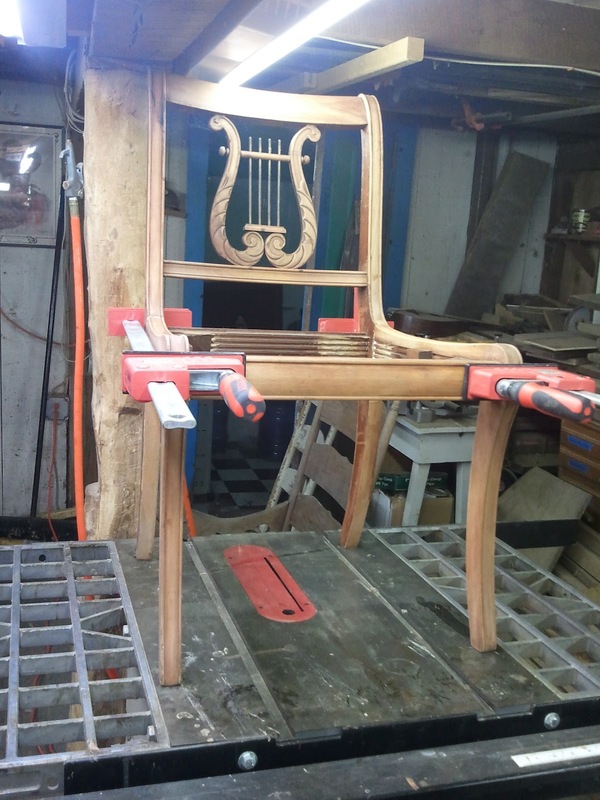 This photo shows one of the chairs being glued. I set them on the table saw (a flat surface) to make sure that all four legs are on the floor. 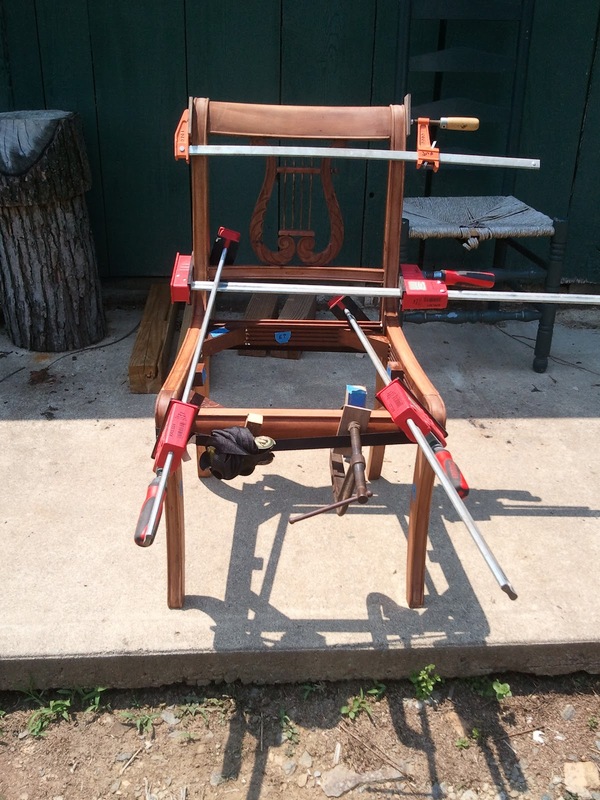 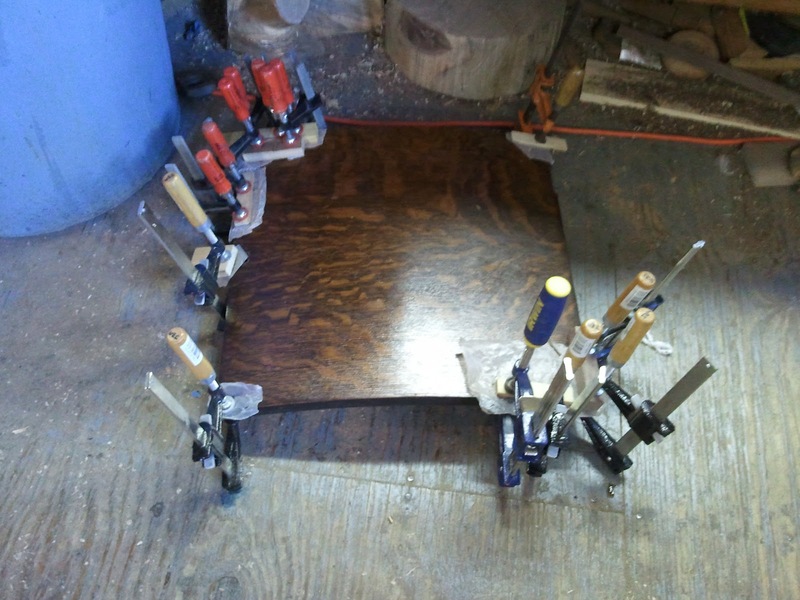 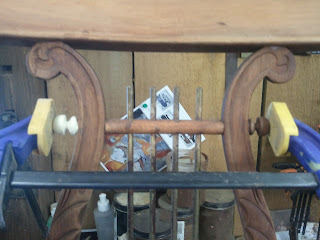 This photo is followed by two others showing chairs clamped while the glue is setting. 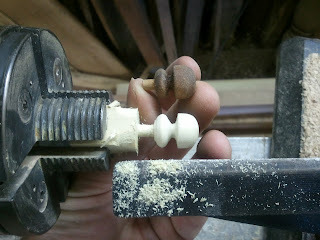 As stated earlier, one of the finials that help to compose the bridge of the lyre back was missing. It was fastened by use of a small round tenon that fit into a drilled hole.Below is a photo of the new finial on the lathe next to the original I used to make the copy. 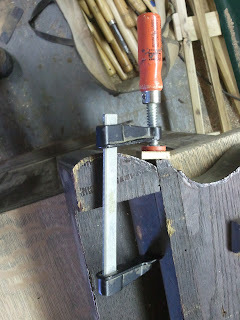 This photo shows the missing glue block being replaced. The next photo shows the new finial being glued in place on the lyre. Below, all four photos are seen sanded, repaired, and ready to stain. The photo following this one shows the chairs after they were stained. 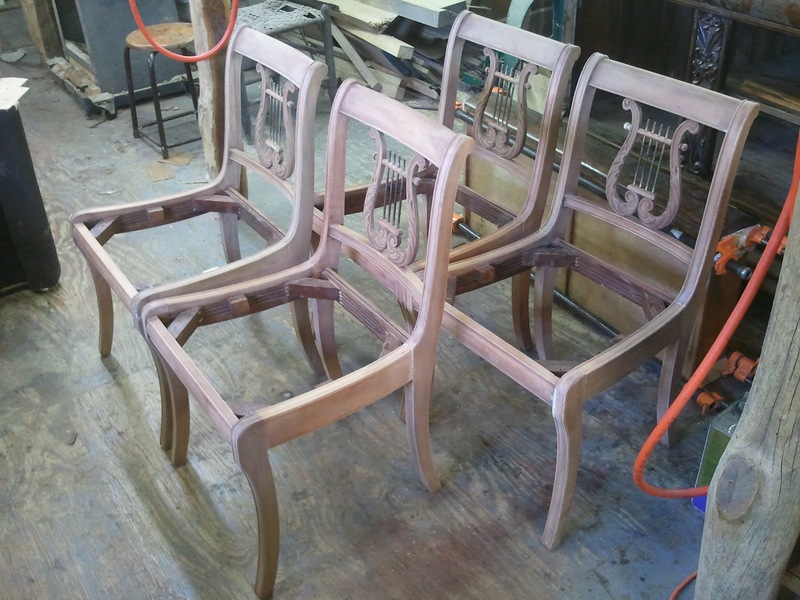 The last four photos show the chairs finished and completed. 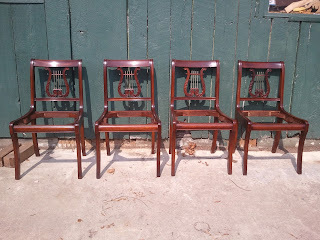 The first three show the chairs from a few angles and the last shows a detail of the lyre back. 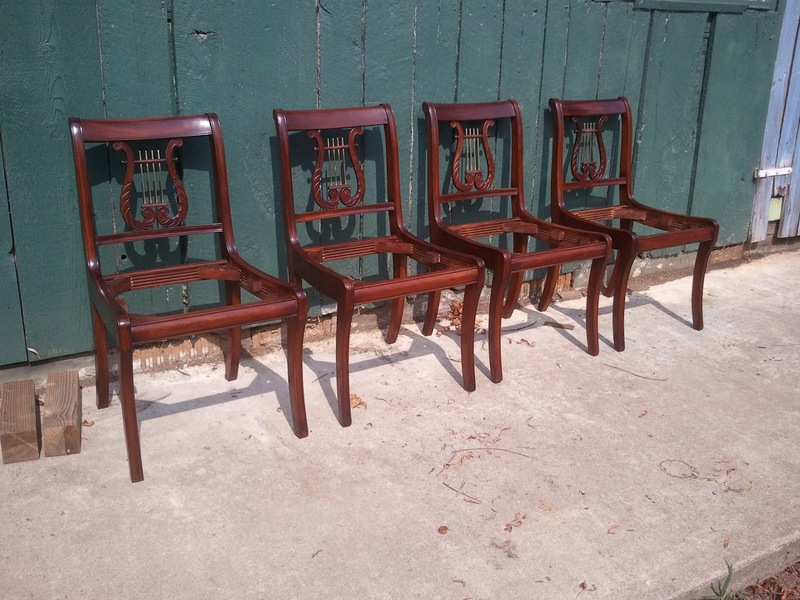 The seats were left off because the customer was going to recover them.